EBSU Post UTME 2018/2019 Registration Form Is Out. 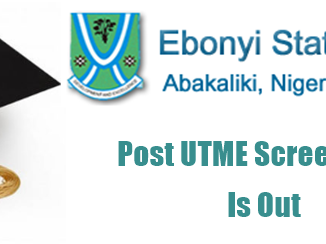 This is to inform all candidates who chose Ebonyi State University, Abakaliki as their University First Choice in the 2018 UTME and scored above 180 and above as well as posses require O/L credits for University admissions, that the admission screening application form is available now. The portal for registration opens on or before September 2018. 14. Await for further directives from the University on the screening exercise. 4. Only candidates whose WAEC/NECO results are successfully verified may be considered for admission into Ebonyi State University. Direct entry candidates who chose ENSI and possess a minimum OND/HND upper credit are also to participate in this online screening Registration for the purpose of screening / verification of their O/Level results only. All payments into Banks shall close on Friday 9th September, 2019 while our website for online registration registration is to be shutdown at 12 Midnight on Friday, 9th September 2019. Send emails to support@tenece.com or gabirel.ugwu@ebsu-edu.net. 0 Response to "Ebonyi State University: EBSU Post UTME 2018/2019 Form and Cut Off Mark For All Department"